In 2015, Sharon Van Etten decided to take a break from music, with a plan to return to school and become a therapist. But two weeks into her first semester at Brooklyn College, she got a call from the casting director for Netflix’s The OA; he’d seen her open for Nick Cave on tour, and asked her to audition for the show. In the three years that followed, Van Etten’s to-do list exploded: Not only did she land The OA role, she also scored a movie for Katherine Dieckmann; took on another acting role in an episode of David Lynch’s Twin Peaks; and got pregnant. All the while, she was familiarizing herself with synthesizers, like the Roland Jupiter 4 that she was introduced to by Michael Cera, with whom she shared a studio space, and she found herself recording demos again. The result is her excellent fifth studio album, Remind Me Tomorrow, and it’s a trip for fans who fell in love with Van Etten’s tender, folksy-rock sound. Inspired by the drone-heavy vibe on Nick Cave’s Skeleton Tree, the album replaces Van Etten’s familiar guitar with propulsive synth and occasionally jaunty keys. Like her earlier work, Remind Me Tomorrow sounds ominous at times—but as Van Etten told me over the phone last week, it’s also full of love songs, with an unmistakable warmth throughout. Hope, it turns out, sounds good on Van Etten, who has written prolifically about heartbreak and despair, based in part on her experience in an abusive relationship with a man who consistently put down her songwriting. There’s an edge to Remind Me Tomorrow; the fear of the unknown looms, even as Van Etten opens herself up to new possibilities. That its themes emerged from a period of her life when she was juggling new experiences—acting, motherhood, college—suggests that she was able to overcome that fear and, if nothing else, put a name to it. Just after leaving the passport office on Tuesday (Van Etten is trying to work out the logistics of taking her young son on tour), she spoke to Jezebel about writing this record and other projects on the horizon—including a comedy series about mothers and their relationship their babysitters. This interview has been condensed and edited for clarity. JEZEBEL: I wanted to talk about the period of your life leading up to recording this album. You recorded a lot of demos in that time. Did you feel like you had more freedom to experiment, because you were technically taking a break from music and not supposed to be working on an album? 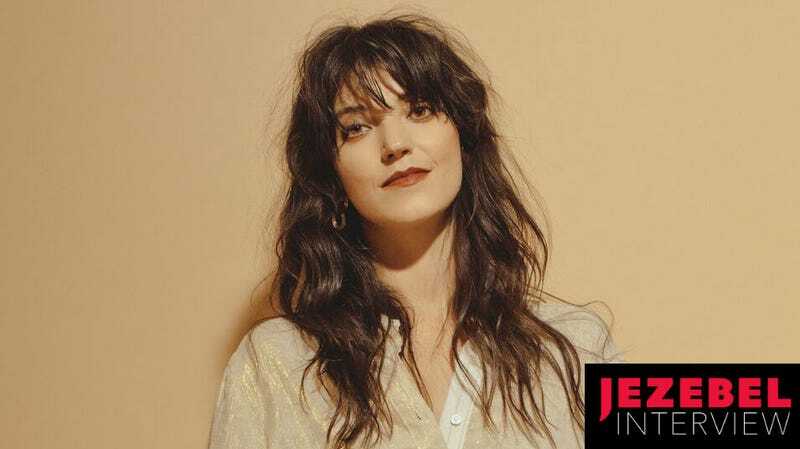 SHARON VAN ETTEN: I was even surprised that I felt like writing at all. I’m lucky that I worked with a label and with people—from my publisher to my management—where no one was pressuring me to make a record. I didn’t have the slightest desire, at least consciously, to do it. I never really write for a record anyway. I’m not good at sitting down and saying, This is what this is about. I always write because I need to write for me, and then I pick songs that have a more universal appeal, where I can sculpt it into something that people can connect to, without it just being me venting. I was writing a score at the time for Katherine Dieckmann and she asked me to write with Ry Cooder’s score for Paris, Texas in mind, which is very guitar-driven, ambient, western, ghost-town music. Whenever I got to a place where [I had] writer’s block, I would put down the guitar and I would look for anything else to play, as a means to clear my head—so I could return to the guitar with a fresh set of ears. I gravitated towards the keyboard, and I wrote a lot of more left-of-center songs and I didn’t realize that’s what I was doing. My whole process is, if I come up with a cool chord progression or a melody or a beat, I’ll hit record and I’ll just go, until I’m done and then I’ll hit stop. I won’t even listen to it. I’ll hold onto it until I have a moment to listen with distance and reflect. So it wasn’t until two years later, in 2017, that I opened that folder. Did it feel like you were making an album then, or did you have to take stock of all the demos and ask yourself where you were going? When I showed my partner at first, there was over 40. There’s a country record in there that I don’t think the world needs right now, and there’s a piano ballads record that’s like, okay, maybe when I’m ready to tour solo. We’re organizing these demos, they’re not all great. Most of them, not great. [laughs] You know, my partner just kind of held my hand, and he said, I think it’s time to make a record. He saw that I had all of this building up, and he got really excited about the left-of-center [demos] too, even though I was nervous about going down that road. Sonically, this record is very different from your earlier ones—but thematically, it’s also a little less dark. There’s a really nice optimism and open-mindedness that runs throughout this record. Is that something you felt nervous about sharing with your fans? Well, I knew I’d be opening a can of worms no matter what. I started writing most of these songs as love songs before I was pregnant, and then I started editing lyrics while I was pregnant and after I had my kid—I finished some of them while staring at my sleeping child. So some of them morphed into love songs about my partner, and some turned into something much deeper. And you know, it was emotional for me to finish, to acknowledge that I’m going through something so intense that is way bigger than anything I felt before, something that I’m still processing. So, yes, I was nervous for the content, and shifting a little. But at their core, they’re still love songs. Sonically, I knew I would be challenging some of my fans. But I think anyone that really knows me and understands me can hear my melodies. I’m still in there. I was in the studio with John [Congleton] and I was never strong-armed; these are all ideas he helped come to fruition. I asked him to. [laughs] I just, I don’t want anyone to think that a man made me do this, or the man. You just have to be as present as you can, no matter how much as happened or how much is ahead of you. I was struck by something you said in interviews about deciding to go back to school and that being sparked by conversations that you were having with fans, who would come up and talk to you at shows. All of your earlier albums have this incredible vulnerability that draws people in, but I was wondering if you ever felt like there was the expectation that, as a woman, you always had to be vulnerable in your writing, and maybe you were finding that you weren’t always able to do that on-demand for your fans. [As for the writing], honestly, my writing comes from that kind of a place. I write whenever I’m going through a really hard time and most of the time I don’t share them. It’s when I find those meandering 10-minute recordings where I feel like there are some pieces I can pull out, that I can turn into something. But it’s always going to come from a vulnerable place. [When I write] I just let myself go, and I’m not thinking about what’s a verse, what’s a chorus. I’ll literally wait months, sometimes years, before I look at it. And then I listen to it, and I’ll write down the lines that I connect with, and I try to think about what I was going through and where I am in that moment. That usually gives me a lot perspective, whether or not I use it in a song. It is like a form of self-analysis. But I never feel forced to write that way. That’s just what I do for myself. What do you hope people will connect with on this album? To be easy on yourself and try to live in the moment. I’m still wrapping my head around that as I look to my past self and my future self. You just have to be as present as you can, no matter how much as happened or how much is ahead of you. Switching from playing guitar to synth, did that change the way you approached singing on the album? Absolutely. I play a lot of minimal chord progressions—they also tend to be in lower registers, which tend to be darker. So I sang in a lower register for most of the songs. I think “Memorial Day” is the only one that’s really high, in the chorus. Everything else is much lower than I would normally sing, and it was really fun, because I could feel more of the grit, and I could lean in to the vocals, just like I would my guitar. Do you know what you’re doing to do onstage, for the songs where you won’t be playing an instrument? White-knuckling my microphone. [laughs] I’m not gonna be dancing or anything. That’s not my style. I’ll just be singing and I’ll try to be addressing the audience and getting into this other version of myself, but you know, learning how to not hide behind something. How was shooting the second season of The OA? I think a lot of New Yorkers are conflicted about that. Yeah, I’m not a hater! It’s funny, there’s such a rivalry, but they’re just so different. But to answer your actual question about the show: it was great, everyone on the show was great, everyone on the production is really amazing, and I just feel constantly encouraged and inspired by people who have been doing this for years and I still have a lot to learn. What can you tell me about anything about the comedy series you’re writing, about moms and babysitters? This is just an idea, and I don’t really know what we’re going to do with it, but basically it’s about a mother and her relationship with her babysitters. And at the core of it, it’s a friendship that’s formed by trusting a complete stranger with your child. But then it’s also about how liberating it is, that that relationship helps the mom go back to work and find herself again. One of my babysitters is a songwriter and a comedian and a writer and she kind of sparked this idea in me, and I asked her if she wants to be a part of it. Her name is Bridgid Ryan, and she made me do standup for the first time. I was nervously holding four pages of typed notes. I’m more interested in the writing than being a standup. I just don’t have the delivery. I admire so many comedians; I don’t want to say I’m a comedian or I’m downright funny. I know that you were hesitant about taking The OA acting gig and I was wondering if you could say a little bit about what you were feeling in that moment—if you were thinking, maybe this is not something that I do, because who am I to take this role? It sounds like maybe that’s also coming up for you in comedy. The whole reason that I took a break from the road in 2015 was to go back to school and I was literally only in school for two weeks when I got asked to audition. I had to drop out of school to take the role, so it just made me feel like a phony. My whole thing is I want to become a therapist, which I still very much do. But I’m only a sophomore, so it’s going to take me a very long time. But I just realized, this is a once in a lifetime opportunity. I should try it. But I also had to acknowledge that people have worked their whole lives towards becoming an actor and I felt badly taking something that other people have worked their whole entire lives for. I spent my teens through my twenties being driven to become a musician. I just had to keep telling myself I’m not cheating anybody because they were looking for me. But I like it a lot, and I’m still learning, and you know, hopefully I’ll just get better.